The ability of microbes to grow either at high salinity (>10% in the context of this chapter), or with hydrocarbons as sole source of carbon and energy, is relatively common. In contrast, there are far fewer known halophilic hydrocarbon degraders, and factors contributing to this may include the reduced solubility of hydrocarbons and oxygen at elevated salinities, and the conflicting demands of salt (hydrophilic) and oil (hydrophobic) on the structure and hydrophobicity of the cell envelope. 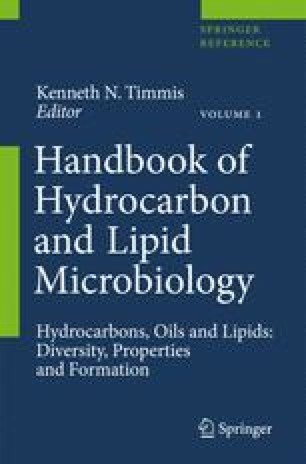 After discussing numerous hypersaline and oil-rich environments and the microbial consortia that have been recovered from them, this chapter will highlight the main hydrocarbon degraders from different taxa with: (1) predominantly hydrocarbon-degrading and mostly haloterant isolates (e.g., Marinobacter and Alcanivorax); (2) predominantly halophilic with some hydrocarbon-degrading isolates (e.g., Halobacteriaceae and Halomonadaceae); (3) others, with some halophilic species, some hydrocarbon-degrading species, and occasionally both (e.g., Bacillales and Actinobacteria).